So you've had the game for a few hours. What weapon have you found? What have you socketted it with? What awesome enchantments does it have? It has an open socket, but I haven't found any cool gems yet. I also not sure if I want to spend the ridiculous amount of gold it will take to maaaybe give it an enchantment. I'm doing 281-561 damage with it, nevermind critical hits (I maxed critical strikes). I've seen her hit for 990ish. Not that fast, but so far, one hit KOs most of the time. 98!? Thats a bit ridiculous, especially with that attack speed! To shame, hacker. So I've kept playing, and hit level 21. I found an arbalest (crossbow) that had a faster attack speed, so the DPS was 400ish. And then I fooled around with enchant. Enchant is your friend. So far, no negatives at all, except occasionally wasted gold. There seems to be *no limit* on the number of times you can enchant the same item. Sometimes, it will improve the existing enchantments. Sometimes it will add new enchantments. And sometimes it will add sockets. The key is that enchant only goes up in price when the number of enchantments is increased. So added sockets and improved enchantments don't increase the cost of future enchantments. 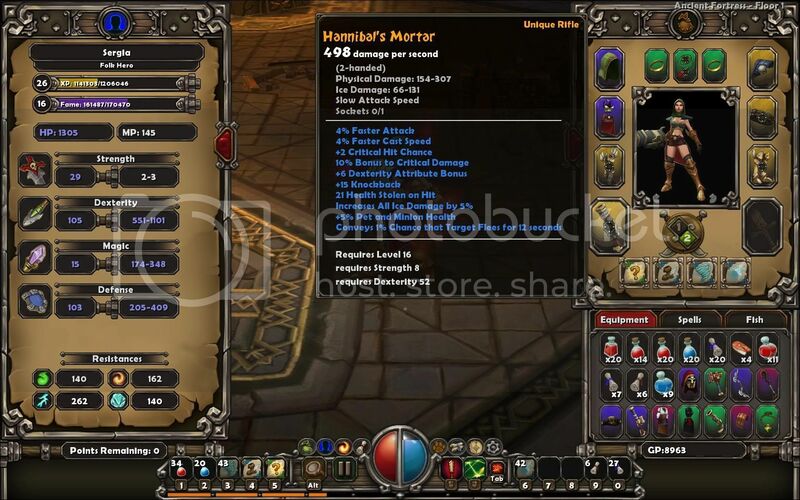 This means that while the enchant cost is still 3k, you can get some killer stats. Note the two empty sockets. On a normal attack, I do 600-700ish, but on a critical hit, it can jump as high as 2,300. Add in an AOE attack that uses my ranged weapon, and so far no challenge. Is the best i've found so far. I'll need to try the enchant trick with it to see how high I can get the dps and if I can get some lifesteal. My lv 11 is using a rifle with 15 life steal per hit, poison + cold damage, and knockback. It's a rare... around 150dps. Some people have reported that there is a small but PRESENT chance that your magical item will lose ALL of its enchantments in favor of new ones. For this reason, I suggest either NOT enchanting ad infinitum, or at least do not do so with your main weapon. Holy **** :[ The 500 dps weapon is insane. I only found crappy weapons so far. Lol with this I would be running through the levels ^^. **** i love smashing stuff in the face with this. 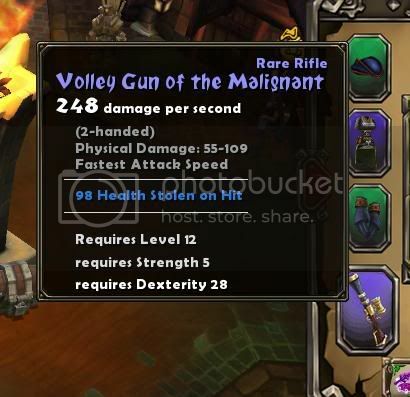 I don't got a pic of my best weapon but it had 333 DPS. I'm now wondering wether i should put this through the retirement and start again, anyone have an insight just as how good a bonus it is? Ricochet crit for over 4k, 21% of the time, at level 18 with that thing. Crazy. Except for the part where I have no defenses and my tiny 45-89 damage reduction doesn't really do much against Very Hard charging lizardmen. Kill or be killed. Very, very messily. My only problem is the screen is shaking ALL THE **** TIME. Got over 45% crit, it's just unplayable so I usually use a lower DPS weapon(1500ish) to even be able to play the game. Whichever mastermind dev thought about having the screen SHAKE on crits should get fired, you shouldn't punish people for getting good items. You can't possibly stand more than 5 minutes playing with this gun. If anyone wants it I can upload my shared stash file, see for yourselves. Some people have reported that there is a small but PRESENT chance that your magical item will lose ALL of its enchantments in favor of new ones. I don't know if this would remove the base bonuses from a unique item like Ice Dragonne, but it happened to a "blue" (rare) bow that I was using. It should be noted, however, that the 2 gem slots I had filled on that bow were not removed. I was able to enchant the bow all over again and get it back up to "uber" status too, so no harm done, really. dude, how? just how the **** 3k dmg per second ? tell me how, the enchanter in town ? 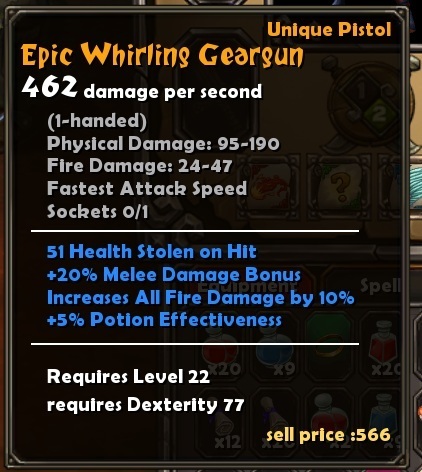 to the one with the 3k dps gun, seriously you must have some godly luck to not having had your enchantments erased while gimping it up to that state. If you put up a gold item and he fails with enchanting it, EVERYTHING get's removed as well. Gold are also much more expensive to enchant. Maybe you shouldn't be jealous and bash on people with greater understanding of the games mechanics. and the sad thing over all of it is that enchanted items are the best, i have my shared stass filled with uniques and set items, not 1 space left. and those stupid enchanted weapons aint getting as good as yours. how? Game only saves after entering/exiting portals, so you can manipulate enchantments, prevent deaths, experiment with skill points, transmutations, etc. (alt-tab, end torchlight.exe in process manager, or simply alt+f4). Edit: Alt+f4 doesn't work. It can be a useful way to save, though. Use the other method.